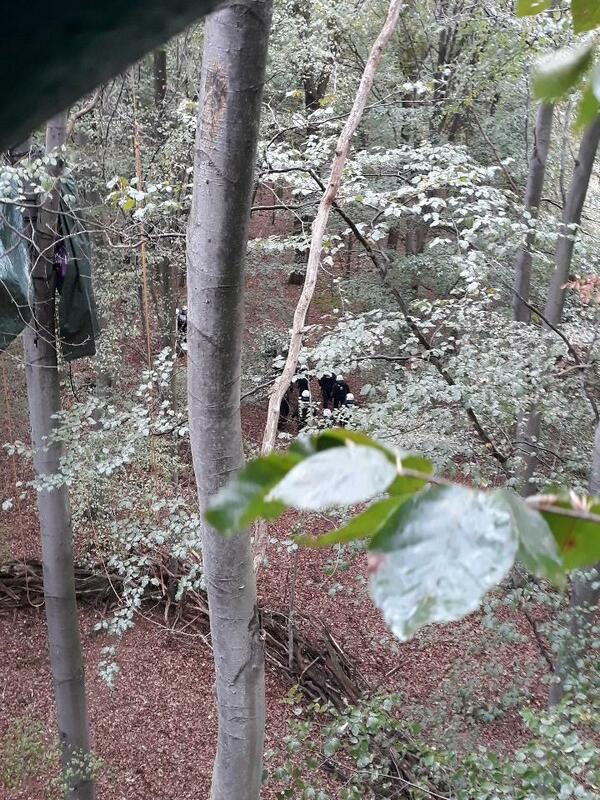 After twenty days of evictions all tree houses in Hambacher forest are evicted now. Paragraph 11 was the last tree house. Yesterday cops evicted several platforms and energy giant RWE started to enclose the beautiful forest with trenches and barrier tape. Yesterday the cops evicted Black Socks, Fenrir 2.0 and Ghosttown, these were new occupations. The last activist at Black Socks, Whiskey, was evicted around 08:00pm. On the day of Steffen’s funeral cops were again risking peoples lives. During one of yesterdays evictions cops were chasing an activist in the trees. A cop grapped one of the feet of an activist. The forest defender lost his balance because of this dangerous maneuver and was hanging upside down in the trees. During the day the cops continued with heavy controls. Yesterday some people reported that they were searched about every 20 meters. The question if these last evictions were illegal or not came up because this third wave of evictions in the past six years were officially carried out for “fire safety regulations”. The NRW state ministery of construction forced the city authorities of Kerpen and Dueren to evict the tree houses with the cheap propaganda lie that the ministery was “worried” about the safety of the occupiers. The fire safety regulations are for houses and not for platforms or tents, so there was no legal base to evict Black Socks and the other platforms yesterday. But of course the cops continued with evictions. Those who still believe in the rule of law were upset. While journos and parlamentary observers were asking if these evictions were illegal or not, RWE started to enclose Hambacher Forest with trenches and a barrier tape. The energy giant was also placing “warning shields” around the forest. That liberals were discussing the legal base of yesterdays evictions might be interesting to influence public opinion, but in the real world it is a kind of satire. After three weeks of evictions for “fire safety reasons”, it should be clear that the state evicted Hambacher forest for the capital interests of RWE. More than 3000 cops occupied the forest and again and again cops were shitting on the so-called rule of law by regularly ignoring the “freedom of the press”, beating up people and vandalizing Wiesencamp, just to name a few of the things the cops did in the past weeks. The question that should be debated is not of yesterdays evictions were illegal or not, but the legitimacy of this kind of state repression. Armin Laschet(CDU), prime minister of the German state of North Rhine Westphalia, his minister of interior Herbert Reul and the state minister of construction Ina Scharrenbach showed that they are nothing more than footmen of RWE and we should not expect anything good from them. Don’t call on politicians to change this or that, organize yourself. Apart from taking prisoners, state and local authorities also banned the weekly forest walk on September 23. That more and more people are asking themselves what is legitimate and not what is legal is an important step forward. More than 7.500 people defied the ban on September 23. The cops gave up after about one hour and many people went into the forest and started to build and reinforce barricades. One week later the cops didn’t even try to ban the forest walk anymore and lost control for hours again. The autonomous movement was weakened in the past years, but the struggle in Hambacher forest activated many people. It was clear that the movement is not strong enough to defend the forest with militant tactics. Although there were some militant actions against companies who supplied lifting ramps and other equipment that the cops and RWE needed to evict the tree houses, people decided to use peaceful civil disobedience tactics (but with determination) on the ground during the evictions. While RWE is escalating the conflict by enclosing the forest, even for people who want to go for a walk, the energy corporation has no options left to win this conflict. The movement will continue to fight in order to abolish coal power plants, the closure of RWE’s open pit mine and fight for the preservation of Hambacher forest. Even when RWE will manage to uproot Hambacher forest, which would be a major blow for the movement, the corporation already lost the coal issue on the German territory. The tree houses are evicted now but the movement is much stronger than three weeks ago, when the evictions started. On Saturday there will be a huge demo and organizers expect more than 20.000 people. On the same day Ende Gelaende is calling for mass civil disobedience, this mixture of tactics could be the way to win this struggle. On Sunday there will be another weekly forest walk. The monopoly of a few energy corporations who are working actively on the destruction of the planet is a major issue in society on the German territory now. There were solidarity demos in dozens of cities. Many grannies and other people that were building barricades in the forest over the past weeks see capitalism as the problem and saw what cops do when they are protecting capital interests. This struggle isn’t over yet, it has just begun. See you on the barricades!